Once Montana Sapphire is mined, it begins the journey that will prepare it to be showcased in fine jewelry. It is a journey that we carefully control, so that we may disclose each step fully, guaranteeing a high quality finished product. That journey begins by carefully cleaning and removing all debris from the rough material to insure there is no contamination during heating. 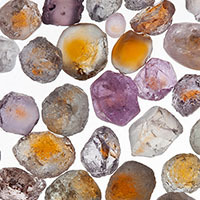 All sapphires sold by Sapphires of Montana are then heated in the USA, without exception, by Dr. John Emmett and Troy Douthit of Crystal Chemistry. Dr. John Emmett, formerly Associate Director of the Lawrence Livermore Laboratory and a world-renowned expert on corundum heat treatment, performed a series of more than 100 experimental runs on more than 75,000 pieces of Rock Creek corundum in 1992-1993. The goal was to determine the optimum method for heating these sapphires to develop their full color potential. The yield (after heating) of colors deemed suitable for gemstone use at that time was about 60-70%. However, further refinement of this technology now allows more than 95% of Rock Creek sapphire to be heat-treated to a commercially usable color. The treatment process also "burns out" the fine "silk" (inclusions of the mineral rutile), which is present in most sapphire and reduces its transparency. The result is that all heat-treated Rock Creek sapphires are transparent, bright and can be highly color-saturated, even in small sizes. 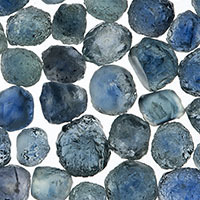 Rock Creek sapphire, as mined, occurs in more than 50 distinct hues. Crystals are almost always zoned as a result of chemical changes during growth, and cut gems typically display two distinct colors. Heating tends to greatly accentuate one of these hues, producing more uniformly colored gemstones. But the heating process also expands the color range and intensifies color saturation. Rock Creek sapphires therefore can be obtained in a wide variety of colors, including multi-colored Kaleidosciope™ sapphires. Heat treatment of sapphire is a routine process that is universally accepted by the gemstone and jewelry marketplace. In recent years other processes have been introduced that add chemical elements to sapphires during treatment, radically altering the color of the finished product. This form of enhancement is acceptable only if disclosed to buyers (which is frequently not the case). 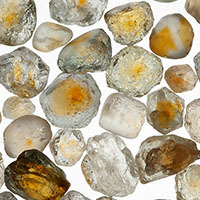 Sapphires of Montana guarantees and warrants that its material has been subjected only to heating, with no coloring agents, fluxes or glasses added during the process. Unheated (natural color) sapphire is also available on a very limited basis.